Mani/pedi services have become nearly as common — and as essential — as a morning latté. This is great news for nail techs, and for salon owners who want to narrow their niche in an ever-growing marketplace. Rather than focusing on enhancement products, some owners have responded by specializing in natural nail services. Many have expanded their menu to include Eastern elements that are more holistic and therapeutic. Adding Eastern methods to salon services is not a new concept. Techs have educated clients for years on the benefits of aromatherapy, acupressure, and reflexology. It shouldn’t surprise us then to see entrepreneurial creativity changing basic manicures and pedicures into spa services that beautify on the outside while promoting balance within. We spoke to salon owners to find out how they repurpose ancient practices as a step of a luxurious spa service. Many ancient cultures practiced dry brushing, but the tools they preferred (or had available) differed. Corncobs have been used to brush the skin, as have dried loofah sponges. More recently, natural bristle brushes are the tool of choice. Dry brushing is well-known, but hasn’t really seemed to catch on as a mainstream practice. This is unfortunate, since the benefits are numerous. As the largest organ in our body, the skin needs some TLC. Proper care improves circulation, aids in the removal of waste, and keeps glands clean and clear. Dry brushing exfoliates the skin, removing dead cells that clog glands and make the skin appear listless and gray. This practice is also said to soften skin, reduce cellulite, break up fat deposits, and stimulate the lymphatic system, clearing toxins from the body. On top of that, dry brushing can be hypnotic and soothing, turning any nail service into a luxury experience. Salon: The Face & Body Spa, Yardley, Pa.
Demspey says brushing is performed first at the start of the manicure or pedicure while the skin is dry, and it is also incorporated into the massage step of the service. Mined from the Himalayan salt mines in the Punjab region of Pakistan, Himalayan salt contains trace amounts of several essential minerals, including calcium, iron, potassium, and magnesium. The salt is believed to be untouched and pure, without contamination from modern toxins and pollutants. Himalayan sea salt has healing properties that help regulate sleep, prevent muscle cramps, improve blood pressure, and support a healthy libido. The Himalayan Salt Stone Pedicure at The Face & Body Spa is a twist on the hot stone massage. “We use a salt stone rather than a smooth river rock to give clients the added benefits of the minerals,” explains Dempsey. The salt stone can be heated or used at room temperature, depending on the client’s preference. The skin absorbs the salt during the treatment, providing clients with beneficial minerals as well as a relaxing massage. 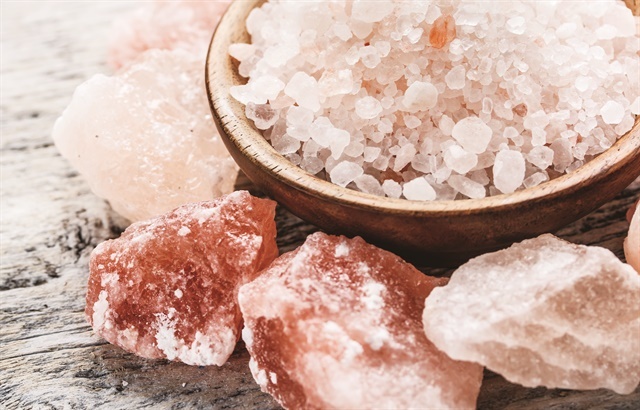 Salon owners can offer clients the benefits of Himalayan salt services in ways other than a salt rock. Alternatives include a Himalayan Brine Bath as the soak portion of the pedicure and a Himalayan Salt Scrub to exfoliate. Both provide the healing properties of the salt without extending the time of the pedicure service. Smooth, black, volcanic rocks are used for hot stone massages because they are believed to have emotional and spiritual benefits. The story goes that since they are made from two natural elements (fire and earth), they provide energy, but also calm our emotions. True or not, there’s no doubt the heat of the warmed stones creates a therapeutic and comforting experience that helps relax and release tight, tired muscles. 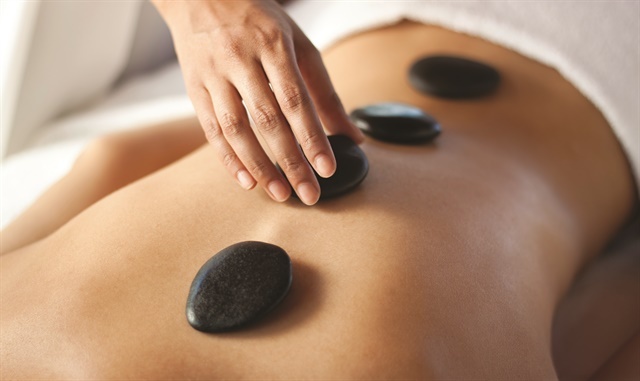 Used during a massage by a trained therapist, hot stones seem to offer a paradox of benefits. The warmth relaxes, but the improved blood flow of the massage increases energy. As an essential mineral, copper has wonderful health qualities. Copper supports a healthy immune system and aids in the relief of joint pain by reducing inflammation. Copper naturally kills germs and bacteria and also creates both a positive and negative magnetic field, believed to increase the energy flow of the body. Some of these benefits can be achieved by using a copper bowl during the foot soak of a pedicure. Salon: Medical Day Spa of Chapel Hill, N.C.
“I used to work 60-70 hours a week in clinical research, but I lost all sense of balance in my life,” says nail tech and Certified Master Pedicurist Tera Killian. She has regained balance in her own life, and accepts a responsibility to center clients as well. Killian’s clients are as delighted as they are surprised to find Eastern principles integrated into the nail services of a medical day spa. Kilian uses a copper bowl for all her pedicures, and offers a hot stone add-on. “Copper bowls retain heat and protect against bacteria,” she explains. 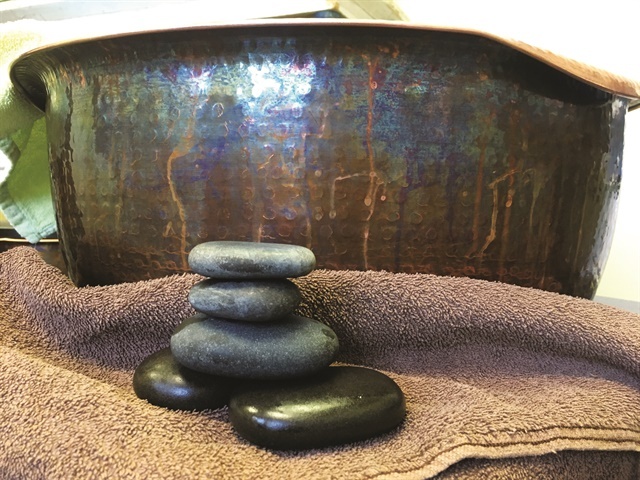 “The stones help clients relax, and their heat helps improve blood flow and circulation.” The hot-stone massage is the last step before the polish for clients who have already received the benefits of a copper foot soak and therapeutic-grade pedicure products. Charcoal has been used for over 3,000 years to filter water and detoxify the body. Charcoal is unique in how it removes toxins. A residue produced by burning natural material, such as wood or coconut shells, charcoal has millions of tiny pores. Those tiny pores don’t simply catch and hold toxins, as a sponge would. They actually bind with the toxins at the molecular level. Once the charcoal is washed away or removed, the toxins are discarded, too. Charcoal continues to gain popularity beyond its use as an excellent water filter. As awareness increases, and as celebrities endorse its benefits, we find charcoal in supplements at health stores, in juice and smoothie drinks, and in treatments at the spa. Salon: Greenfield Nails and Spa, Gilbert, Ariz.
“Clients are familiar with the concept of detoxing, so when they see a detox pedi on the menu, they are interested in trying the service,” says owner Tom Sisouvanh. “The charcoal behaves like a magnet and pulls impurities out of the body through the skin,” he explains. Dead cells are also removed, leaving skin incredibly soft and shiny, as though it’s been polished. Techs may find they need to warn clients of the visible difference of a detox pedi. The black foot soak and spa products aren’t as immediately appealing as crystal clear water, bubbles, and lovely scents. Charcoal may dry the skin as it pulls out toxins, so if you make your own charcoal scrubs or creams for spa use, be sure to apply a hydrating lotion or oil during the treatment. Ayurveda originates in India, and is a Hindu belief that guides how to practice mind and body health. Translated as the “science of life,” Ayurveda strives for balance within the environment, as well as the body, mind, and spirit. Balance is achieved through diet, massage, aromatherapy, and behavior. “The two main guiding principles of Ayurveda are 1) the mind and the body are inextricably connected, and 2) nothing has more power to heal and transform the body than the mind,” says Dr. Deepak Chopra, founder of The Chopra Foundation. Though meant to be a lifestyle guide, Ayurveda is often viewed in the West as a supplement that can be combined with other practices and beliefs. 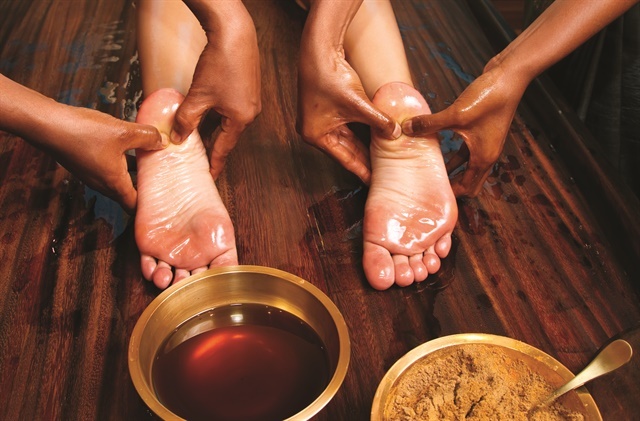 We see examples of this as Ayurvedic services make their way into more and more salons and spas. Salon: Les Beaux Vous, Torrington, Conn.
Les Beaux Vous offers clients a unique Ayurvedic pedicure service that incorporates an extended Indian foot massage technique known as ”padabhyanga.” Warm oil and Indian herbs are blended together and then massaged into the foot and leg, with focus on pressure points in the arch, ankles, and heel. The benefit is a deep level of relaxation. Padabhyanga also improves sleep and helps with stress, headaches, and migraines. “Many clients aren’t familiar with Ayurveda, but once they try a pedicure with this technique, they don’t go back to the other ones,” says nail tech Lucia Pullano. Ayurveda requires special training, so it isn’t as easy to incorporate as some of the other eastern elements. However, nails techs may find a growing service opportunity by becoming familiar with this ancient method.